Born in Fort Scott, Kansas, in 1912, Gordon Parks was a photographer, film director, author, and musician. Parks began photographing at the age of twenty-five, after purchasing a camera in a pawnshop. Initially working as a fashion freelance photographer, he moved to Chicago in 1940 and began photographing the South Side of the city, leading Parks to become the first photographer to receive a Julius Rosenwald Fellowship in 1941 and the opportunity to join the photography project of the Farm Security Administration (FSA) in 1942. The photography project in the Historical Section of the FSA was originally formed as part of the Resettlement Administration (RA). The RA was created in 1935 to rehabilitate exhausted land, resettle struggling farmers, and build relief camps for migratory workers and refugees from the Dust Bowl. The photographic project’s purpose was to document the plight of the rural poor and compile visual evidence supporting the RA’s educational campaign to achieve its objectives. The RA was transferred to the Department of Agriculture and folded into the FSA in 1937. 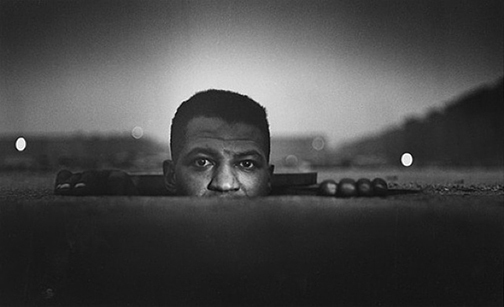 Gordon Parks is cited as the only African American to photograph for the FSA. During his time working for the project, he photographed Washington, DC, home of the FSA headquarters, portraying the city under the rules of segregation—while being under the rule himself. Parks took many portraits of Ella Watson, an African-American woman employed on the cleaning crew of the FSA building, including his iconic image American Gothic, Washington, D.C. (1942). He photographed with the FSA until the photography project ended in 1942, and subsequently photographed for the Office of War Information until 1944. Parks returned to fashion as a freelance photographer for Vogue in 1944, where his work appeared regularly for several years, and in 1948 he became a staff photographer and writer for Life magazine. He covered a wide range of subjects for Life for over two decades and famously photographed segregation in the south in 1956 while on assignment. The magazine sent its only African American photographer to Birmingham, Alabama and the surrounding area, to document the region wrought with racism. Parks lived with a shareholder’s family for two weeks, constantly being tormented by Klansmen and white supremacists and fearing his life, as well as his subject’s lives. The photo essay, “The Restraints: Open and Hidden,” was included in the September 24, 1956 issue of Life. Many of the images were not published and deemed lost, only recently discovered in 2012 in a storage container. 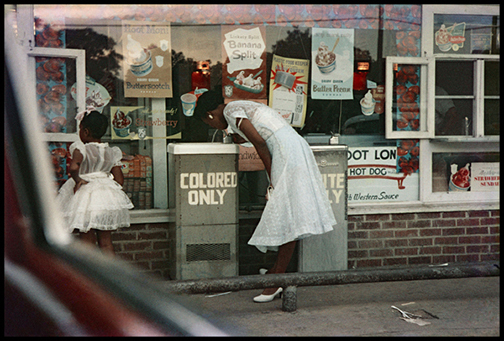 They were printed posthumously by the Gordon Parks Foundation. Later in his career, Parks turned to filmmaking. He was the first African-American to direct a Hollywood film. The film, The Learning Tree (1969), is based on his autobiographical novel of the same title (1963). He is best known in film for directing Shaft (1971). 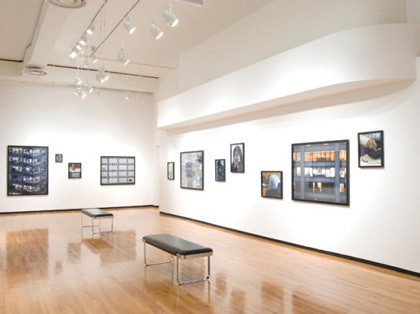 Parks’s work has been widely exhibited, including a traveling career retrospective, Half Past Autumn: The Art of Gordon Parks, organized by the Corcoran Gallery of Art in Washington, D.C., in 1997, and resulting in a monograph of the same title. Posthumous retrospectives include Bare Witness: Photographs by Gordon Parks at the Phoenix Art Museum, AZ (2011), and Gordon Parks: Photographs from the Collection at the Corcoran Gallery of Art, Washington, D.C. (2011-2012). Parks was a recipient of the National Medal of Arts from the National Endowment for the Arts (1987), the Jackie Robinson Foundation Lifetime Achievement Award (2002), and over fifty honorary doctorates. He was inducted into the International Photography Hall of Fame and Museum, Oklahoma City, OK, in 2002.